The only difference between science and screwing around is writing it down. Motivation: Semantic tagging of organism mentions in full-text articles is an important part of literature mining and semantic enrichment solutions. Tagged organism mentions also play a pivotal role in disambiguating other entities in a text, such as proteins. A high-precision organism tagging system must be able to detect the numerous forms of organism mentions, including common names as well as the traditional taxonomic groups: genus, species and strains. In addition, such a system must resolve abbreviations and acronyms, assign the scientific name and if possible link the detected mention to the NCBI Taxonomy database for further semantic queries and literature navigation. Results: We present the OrganismTagger, a hybrid rule-based/machine learning system to extract organism mentions from the literature. It includes tools for automatically generating lexical and ontological resources from a copy of the NCBI Taxonomy database, thereby facilitating system updates by end users. Its novel ontology-based resources can also be reused in other semantic mining and linked data tasks. Each detected organism mention is normalized to a canonical name through the resolution of acronyms and abbreviations and subsequently grounded with an NCBI Taxonomy database ID. In particular, our system combines a novel machine-learning approach with rule-based and lexical methods for detecting strain mentions in documents. On our manually annotated OT corpus, the OrganismTagger achieves a precision of 95%, a recall of 94% and a grounding accuracy of 97.5%. On the manually annotated corpus of Linnaeus-100, the results show a precision of 99%, recall of 97% and grounding accuracy of 97.4%. Availability: The OrganismTagger, including supporting tools, resources, training data and manual annotations, as well as end user and developer documentation, is freely available under an open-source license at http://www.semanticsoftware.info/organism-tagger. 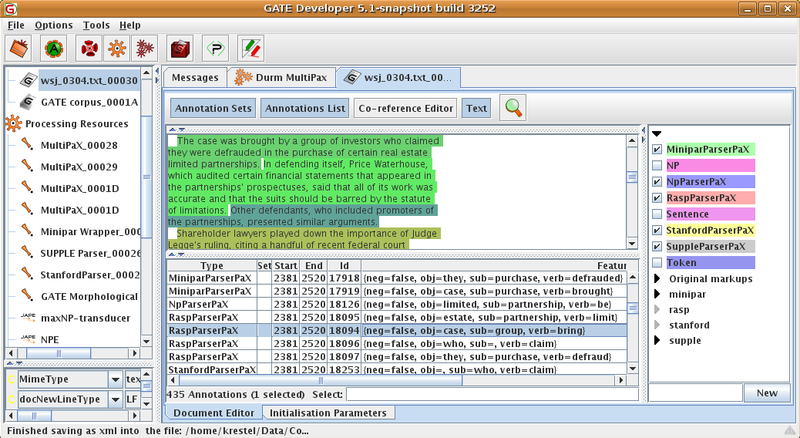 Screenshot of MultiPAX resultsIn this paper, we describe the open source GATE component PAX for extracting predicate-argument structures (PASs). PASs are used in various contexts to represent relations within a sentence structure. Different ``semantic'' parsers extract relational information from sentences but there exists no common format to store this information. Our predicate-argument extractor component (PAX) takes the annotations generated by selected parsers and transforms the parsers' results to predicate-argument structures represented as triples (subject-verb-object). This allows downstream components in an analysis pipeline to process PAS triples independent of the deployed parser, as well as combine the results from several parsers within a single pipeline. Ontology population from text is becoming increasingly important for NLP applications. Ontologies in OWL format provide for a standardized means of modeling, querying, and reasoning over large knowledge bases. Populated from natural language texts, they offer significant advantages over traditional export formats, such as plain XML. The development of text analysis systems has been greatly facilitated by modern NLP frameworks, such as the General Architecture for Text Engineering (GATE). However, ontology population is not currently supported by a standard component. We developed a GATE resource called the OwlExporter that allows to easily map existing NLP analysis pipelines to OWL ontologies, thereby allowing language engineers to create ontology population systems without requiring extensive knowledge of ontology APIs. A particular feature of our approach is the concurrent population and linking of a domain- and NLP-ontology, including NLP-specific features such as safe reasoning over coreference chains. Reported speech in the form of direct and indirect reported speech is an important indicator of evidentiality in traditional newspaper texts, but also increasingly in the new media that rely heavily on citation and quotation of previous postings, as for instance in blogs or newsgroups. This paper details the basic processing steps for reported speech analysis and reports on performance of an implementation in form of a GATE resource. Text Mining in biology and biomedicine requires a large amount of domain-specific knowledge. Publicly accessible resources hold much of the information needed, yet their practical integration into natural language processing (NLP) systems is fraught with manifold hurdles, especially the problem of semantic disconnectedness throughout the various resources and components. Ontologies can provide the necessary framework for a consistent semantic integration, while additionally delivering formal reasoning capabilities to NLP. In this chapter, we address four important aspects relating to the integration of ontology and NLP: (i) An analysis of the different integration alternatives and their respective vantages; (ii) The design requirements for an ontology supporting NLP tasks; (iii) Creation and initialization of an ontology using publicly available tools and databases; and (iv) The connection of common NLP tasks with an ontology, including technical aspects of ontology deployment in a text mining framework. A concrete application example—text mining of enzyme mutations—is provided to motivate and illustrate these points. Accurate lemmatization of German nouns mandates the use of a lexicon. Comprehensive lexicons, however, are expensive to build and maintain. We present a self-learning lemmatizer capable of automatically creating a full-form lexicon by processing German documents. Submitted by rene on Thu, 2007-05-31 08:59. I'm happy to announce the first public release of our free/open source Durm Lemmatization System for the German language. The release comes with source code, binaries, documentation, resources (German lexicon, Case Tagger probabilities), and manually annotated texts from the German Wikipedia for evaluation. Submitted by rene on Sat, 2007-03-03 09:08. I just posted a small update to my multi-lingual noun phrase chunker (MuNPEx) for GATE. Supported languages are now English, German, French, and Spanish (beta).